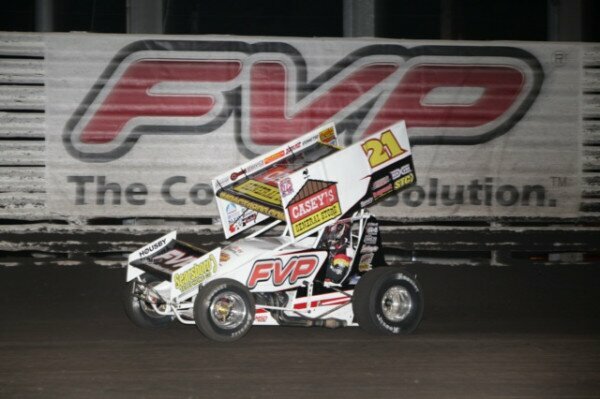 Brian Brown took another step towards achieving his dream of winning the 2013 FVP Knoxville Nationals Thursday night at Knoxville Raceway. Brown capitalized on a great start to go from fifth to second and then held off multiple challenges by Kerry Madsen for the victory. By virtue of his performance throughout the night Brown ended up second in points to Joey Saldana, earning him the outside front row starting position for Saturday night’s A-Main. Washington resident Roger Crockett and Scott Winters started on the front row for the 25-Lap feature. Crockett took the lead with Scott Winters, Brian Brown, and Stevie Smith racing three wide for second. Brown moved up from fifth to second in less than a lap with Smith sliding into third. One lap later Kevin Swindell disposed of Winters off of turn two for fourth. While working lap three John Agan rolled to a stop in turn four. Agan went to the work area and was able to make repairs and rejoin the field. During the restart Brown dove to the bottom on Crockett, who appeared to go through the middle, and took the lead off of turn two. Madsen motored around the top and took second away from Crockett in turn three. As that action took place Brian Paulus spun in turn three to bring out the caution flag. Paulus was able to restart at the tail of the field. Brown led Madsen to the restart. Madsen got a run at the top of the track, but Brown went from bottom to top between turns one and two to block. Madsen tried to drive under, but Brown shut the door diving to the bottom of turn three to maintain the lead. With 10 laps to go Brown came up on slower traffic and allowed Madsen to close in. Behind the lead duo Kevin Swindell moved up through the field taking over third spot on lap 18 from Scott Winters and began to close on the leaders. Late in the race Brown managed to use the traffic to his advantage and open up enough space for the comfortable victory over Madsen, Swindell, Crockett, and Winters. 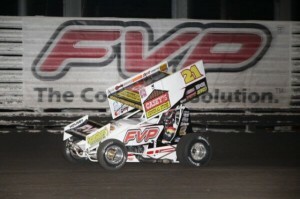 Saldana was the fastest qualifier over the 53 car field with a lap of 15.387 seconds. Jack Dover, Wayne Johnson, Stevie Smith, Terry McCarl, and Robby Wolfgang won heat race events. Knoxville Raceway point leader Bronson Maeschen won the C-Main event while Danny Lasoski won the B-Main. A-Main (25 Laps): 1. Brian Brown, 2. Kerry Madsen, 3. Kevin Swindell, 4. Roger Crockett, 5. Scott Winters, 6. Cody Darrah, 7. Joey Saldana, 8. Craig Dollansky, 9. Terry McCarl 10. Stevie Smith, 11. Danny Lasoski, 12. Wayne Johnson, 13. Dusty Zomer, 14. Mark Dobmeier, 15. Sam Hafertepe, Jr., 16. Jack Dover, 17. Steve Kinser, 18. Jac Haudenschild, 19. Bill Balog, 20. Brad Loyet, 21. Rico Abreu, 22. Robby Wolfgang, 23. John Agan, 24. Brian Paulus.